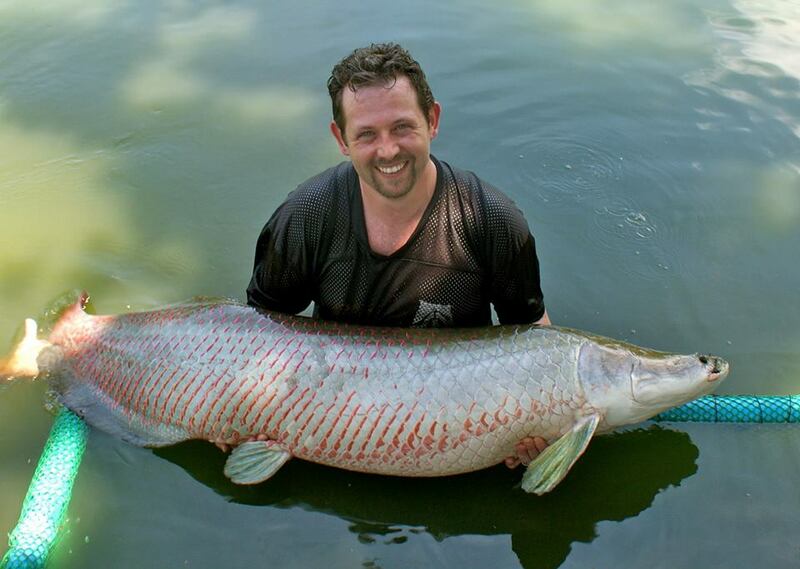 Arapaima – Every angler wants to catch one, it’s on their bucket list! 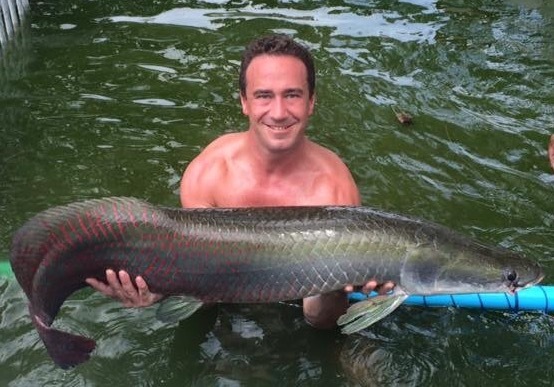 However – Arapaima are not the big brute of a fish that they seem to be in TV shows like ‘River Monsters’. They are in fact quite fragile when you keep them at a fishery. 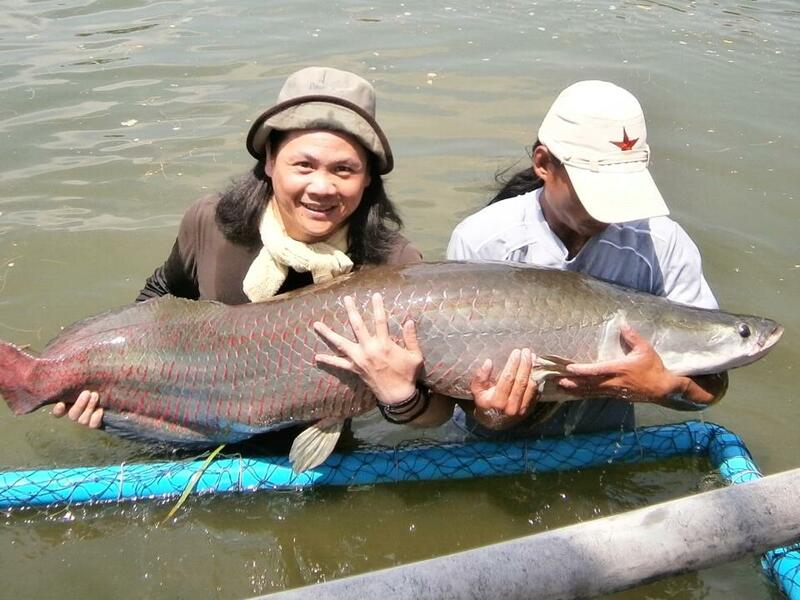 We have had Arapaima at Hua Hin Fishing Lodge since early 2008. Experience with these fish has taught us three main ‘weaknesses’ that the fish has. Having recognised these issues, we have taken steps to minimise the risk to the fish when it is caught. When Arapaima feed, they simply turn into eating machines and will gulp hook bait often deep into the gut, making hook retrieval virtually impossible. They are also very partial to chicken – cooked and uncooked. Firstly we only use a dead-bait, which is a local sea fish (Similar to a small mackerel) which is cut up and placed on the hook. This provides a rather smelly bait that Arapaima find attractive but tend not to swallow as much as say chicken. As a result, less hooks end up in the gut. Secondly we use only barbless ‘dissolvable’ hooks. So – if the hook is swallowed, it should dissolve within a couple of weeks. 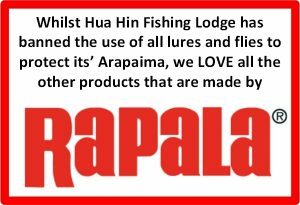 For the above reason we have banned Fly Fishing and Lure Fishing at Hua Hin Fishing Lodge. Experience with these fish has taught us that both ‘Fly’ & Lures can and do end up in the gut of the Arapaima and will kill it. All fish are stressed when caught – anyone who tells you different is a liar. However, some fish seem to tolerate the catching and unhooking better than others and are simply more resilient e.g. Pacu and Amazon Redtail Catfish together with the local Pla Suwai Catfish all fair far better than the Arapaima – which can sometimes go into a state of visible shock. As soon as possible after the fish is brought to the bank, it is transferred to a floating cage and then ‘walked’ to a de-stressing pond. Once in the pond a supply of fresh aerated water is turned on which has the effect of calming the fish. The fish is released after an hour or so. Arapaima have a fundamental dependence on surface air to breathe. In addition to gills, they have a modified and enlarged swim bladder, composed of lung-like tissue, which enables them to extract oxygen from the air. This is an adaptation to survive the conditions of the Amazon floodplains, but requires the arapaima to surface for air every 5 to 15 minutes. Improper handling can rupture this swim bladder and kill the fish. 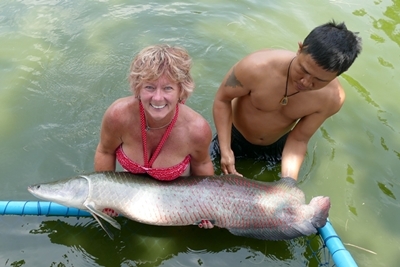 Special care is needed when dealing with Arapaima, as since they are large, they can be hard to handle. With catch-and-release after the fish is landed, it must be held for five minutes until it takes a breath. The fish has a large blood vessel running down its spine and lifting the fish clear of the water for trophy shots can rupture this vessel, causing death. Arapaimas are also known to leap out of the water if they feel constrained by their environment or harassed. We have a few simple rules when an Arapaima is caught. If a customer wants a ‘trophy’ photograph – no problem – but the customer gets into the water with the fish and only handles it with our guide present. This can be carried out in the de-stressing pond where the customer can gain easy access to the water. Of course, they have immense strength and agility and if you try a head-butting contest – you will lose. So we recommend the tail end of the fish – it’s up to you. Kissing the fish is NOT recommended. The fish may well raise up in panic as you get close, with painful and dangerous results. At Hua Hin Fishing Lodge, we offer you the chance to tangle with one of these prehistoric Amazon giants at a cost that is far lower than other fisheries. 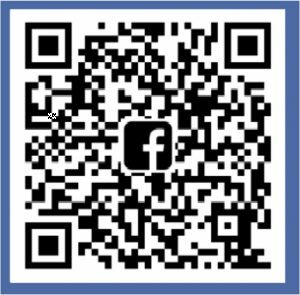 That’s a secret…………but check out the rest and then come to the best. Our Arapaima are well looked after, and range from around 25 to 80kg. OK – they are NOT monsters – but there again our prices are not monstrous either.